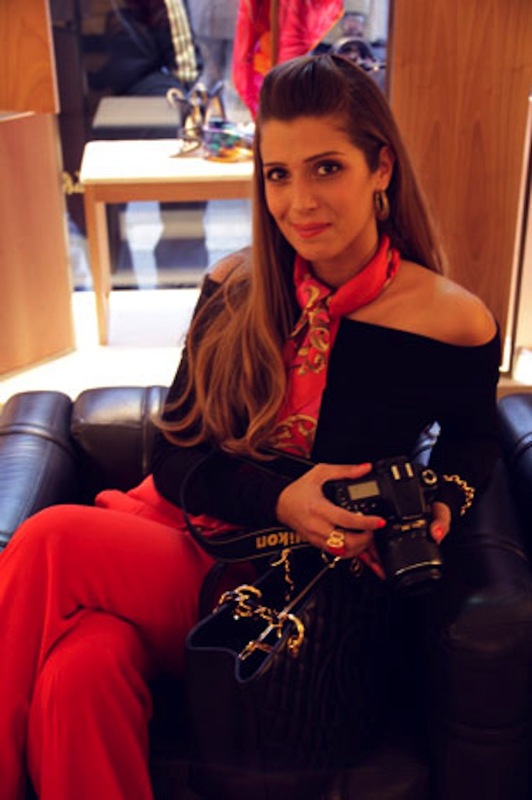 Salvatore Ferragamo: what I wore to the event | Cosa Mi Metto??? This is what I decide to wear for the presentation of the Ferragamo collection that I showed you yesterday! Finally I decided to wear the color of the year: Tangerine Tango! How do I look? Questo è ciò che ho deciso di indossare per la presentazione della collezione di Ferragamo che vi ho mostrato ieri! Finalmente ho deciso di indossare il colore dell'anno: Tangerine Tango! Come sto? Thank you so much for your comment dear - great post, i love the pictures. You look amazing!You are so preety! The scarf is the perfect finishing touch!! your outfit is beautiful. so bold and classic. Per prima cosa complimenti per il look! mi piace moltissimo...! Ti aspetto anche da me!!!! BEAUTIFUL!!! thats all i can say :) have a great start in the week! you look great! beautiful pants! Ti sto seguendo su GFC, ora clicco anche sulla tua pagina facebook! Purtroppo non ho un profilo twitter per il blog, credo però che lo farò molto presto! Like on red carpet ;) just wonderful! Aw great, I'm following you now on bloglovin'! Your scarf and pants are just super gorgeous!! stai benissimo! mi piace davvero tanto questo look, uno dei miei preferiti tra i tuoi! :) un bacione! You look so elegant! So nice! And I love your red pants! you are so beautiful!!! your look is spectacular! Hoping we'll get more readers in the near future. The lipstick is from Kiko! sei sempre bella...ma anche coraggiosa! sbaglio se dico che il foulard é H&M? ad un evevnto da Ferragamo!! Great look! Love the scarf! Very happy. Now I watch your blog. I also invite you to observe. You are very pretty. Love the outfit! You're so gorgeous!!! me encantaria que hagas lo mismo por mi! So pretty !! thanks for your sweety comments on my blog darling ! and sorry because my week has been horrible and I could pay the attention your blog deserve ! I ´ll be please to follow by bloglovin and facebook ! and I hope see you there too !!kisses!! You look sooo beautiful! Gorgeous trousers! wow .. me gusta! todo es hermoso! Rojo tienes razón!una buena combinación! me encanta! you are so beutiful! as always! E' un look molto bello! You look lovely!! I love your scarf and pants! What a great pop of color! Thank you for visiting my blog and leaving a comment. I did also write in English a while ago. But it was too time consuming to keep it up. You look gorgeous in all the pics. You look so good on red. questi pantaloni sono bellissimi comunque! Thank you soo much for sweet words on my blog:) I like yours to and will follow..you can follow me on twitter also if you want:) I must say you look AMAZING. I wish you a very lovely week. Thank you for your comment!! I just followed you, so you can follow me back:) love your blog! You look lovely! you look beautiful!!! happy monday! Devo essere sincera, il modello del pantalone non mi piace, ma trovo che tu sia veramente splendida. Hai un bellissimo volto! love it ! you look so amazing ! i really LOVE IT <3 ! officly we can see each other. We would love to follow you if you'd follow back? 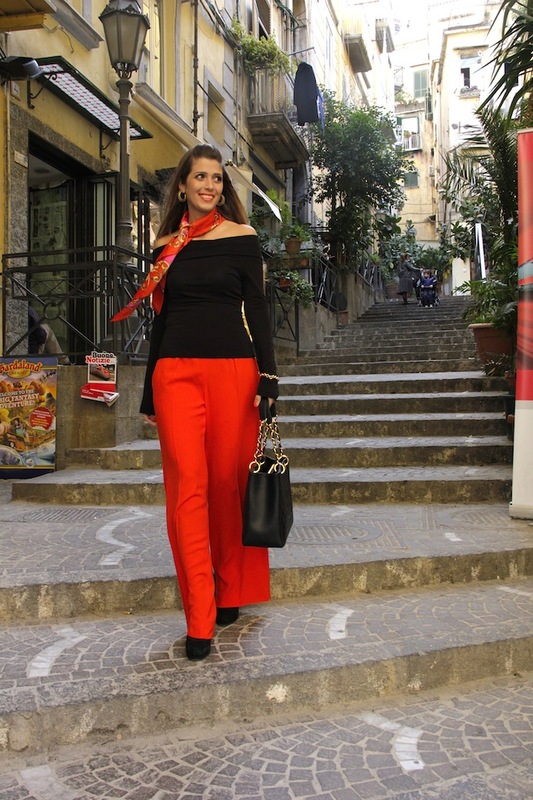 Tangerine Tango looks great on you, love the trousers! Fabulous pants and gorgeous scarf! Love this look, you look lovely! Of course we can follow each other. On GFC and FB? What do you like? Fabry e Vale state benissimo! Super cute look! Great trousers! I'm following you! I would love it if you would follow me too! Gorgeous outfit, I love the bold red with the black. Thanks for the love on my page. Love ur style, so ofcourse I Agree on the follow each other. Your newest follower. hello I will follow, come follow me? What a lovely outfit, you are simply gorgeous! I recently did a review on a pretty Lulu’s dress and would love it if you can stop by and check it out, thanks so much! congratulations for you blog, i love it! I love tangerine , it so perfect spring/summer colour and it looks on you wonderful. You have styled up this look classic and chic. Your idea is great, to follow each other. Following you now, hope you do the same. me encanta tu bloog!! te sigo desde yaa!! Bella principessa! :) The whole look is an A+! Congrats! there was a mistake with the twitter widget, but now is available :) so you can follow me. You look gorgeous! I love your Chanel bag and bright outfit! p.s. in case you haven't dropped by yet, we're having a $100 Shopbop giveaway open internationally! What a nice outfit! love that Chanel bag <3. I love this ensemble. The Scarf steals the show. Te mando un beso y te sigo ! Wow, you look so gorgeous and I love the scarf with this top. So chic! Thank you so much for your sweet words!!! Grazie mille per le vostre dolci parole!!! Waouou !!! You're so beautiful, this outfit is so nice, black and red are my favorites colors and my favorite combination ! Kiss from Paris and see you soon ! you look so nice, i´d love to follow each other - just started! Molto bella la tua borsa :D Reb, xoxo. Wooow! I love your outfit,and in i love your blog! I have been following your blog!! You look really beautiful! I love this outfit! Sei stupenda!!! Cmq ti sequo anche sul facebook, ma io sono anti-talento per PC e tutte le cose sul internet. Non capisco, come ho fatto avere un blog :o). Ho fatto twitter, ma non lo so molto bene, come usarlo :o/. Si si, una bionda, ma facio grandi passi :o)))!!! Ma dopo ti seguo anche li ;o). Buona giornata! Xoxo V.V. So stunning. Those pants are to die for! OMG!!! This outfit is perfect!!!!!! Thank you for the comment,becouse now, I can begin to watch Your blog. Now I will often observe Your blog, and I invite on my blog :). Love the outfit and especially the trousers! Great! I love your style and blog! This outfit I really like! You look beautiful!! 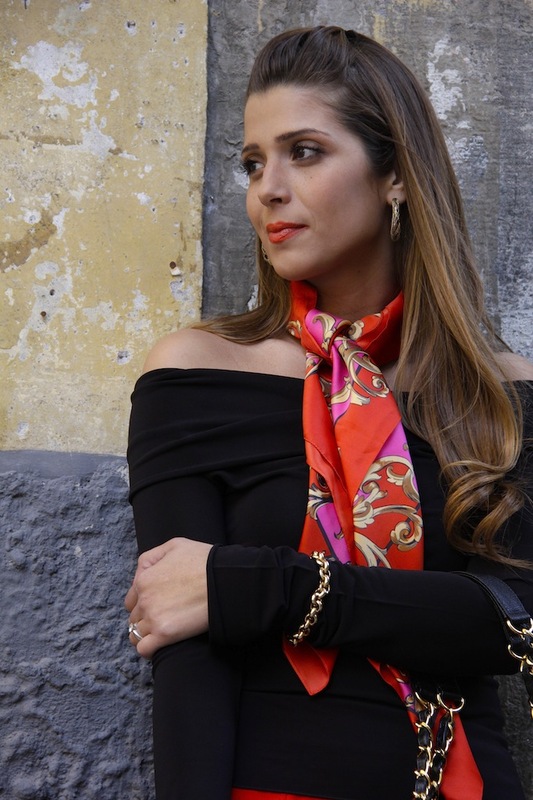 I´m in love this scarf!! yoou are espectacular with this outfit!!! amazing!!!!!!! I created a button, so you can watch me now. I will be happy to visit your blog, becouse your clothes are very interesting and I like it ;D.
Your outfit is absolutely gorgeous... Love your scarf! You look so elegant! The pops of red are perfect on you. Love the outfit, it is so classy and perfect for that kind of event. I also love how your lipstick kind of matches your trousers!!! Amazing! 2. You have amazing style! 3. So jealous you live in Italy! PS. I almost forgot to tell that I love your scarf! Chic look & very beautiful scarf! Your pants and your scarf are great. I like your chic style. This pants are so beautiful! Look amazing on you!